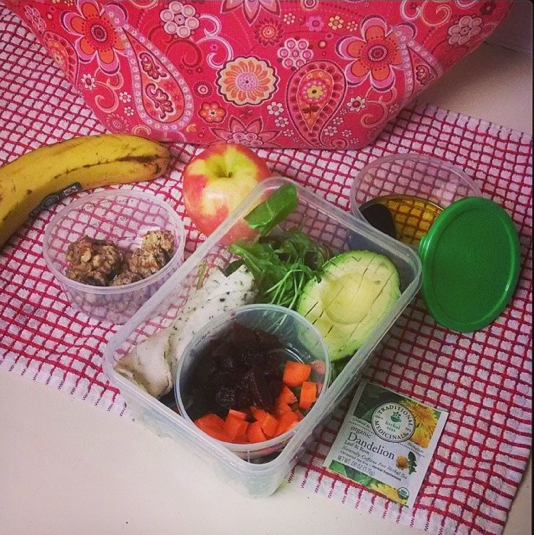 Post-Cleanse Living and Surprise Recipe! You may be wondering what has been going on since the cleanse. Has she binged on chocolate and dairy? Has she thrown away all of her healthy habits? Luckily, I have been pretty good actually! I did have that day of chocolate binging, and man I enjoyed it! Milk Chocolate Covered Potato Chips are something dangerous. However, I noticed how bad it made me feel later on, causing a sugar headache, and have been really good in choosing healthy treats as opposed to treats filled with refined sugar, which I really do not need in my life. Here is one of my favorite sweet treats I like to eat when I'm craving something yummy, but am not willing to feel all of those guilty, un-fun side effects. These are fool-proof, delicious, and guaranteed to trick any friend into thinking they are real brownies. I have already tested them on 10 different people, and the reaction is always the same: "Oh my gosh, those are actually delicious" "You can make more of these please..." "I hate dates, but I love these, they just taste like chocolate!" Blend walnuts, pitted dates, cacao, sea salt, coconut oil, in food processor until blended well. You'll be left with a chunk of the mixture, which can easily be formed into balls. You're going to do just that. Form into 1 inch balls, and roll first in honey (if using, as it allows for a thicker layer of coconut and added sweetness), then in coconut flakes. If not using honey, simply roll into balls and press coconut flakes onto the bites. I usually do sans-honey for less sweetness, as I think the dates are sweet enough! Voila, delicious, you'll want to make more and more and more. I don't buy sweets with refined sugar in it, unless I'm really feeling like I deserve a splurge. I prefer now to make homemade chocolate, like this recipe that my aunt showed me, without refined sugar, and get creative by slathering almond butter on top! I am much more excited about the power of nutrition, and the power that is in my hands! What's more is that Jo and Jules and the rest of the team are all fantastic people, and really care about helping you out. January 27, 2014 in "The Conscious Cleanse"
Good Sunday Evening Everyone, Right now you've probably just finished watching the Grammy Awards and eating luscious amounts of food. I am very delayed in talking about the past 4 days, so I will do my best to summarize in a short manner, and then make my way over to discussing what I've learned from the cleanse, what I am including in my daily life moving forward, how I feel, and what I've learned. I made these little almond "Healthy Fig Newton" balls the other day. They were very mildly sweet as figs naturally are less sweet than dates, but I think they were pretty good and they got good reviews. Inspired by a healthy local juice bar, which I've mentioned before, and ecstatic that I finally found my misplaced strainers, I decided to make ginger shots! They are sooo yummy. I just put a shot of water with a one inch cube of ginger, and the juice of half a lemon in the Nutribullet and strain it. Instantly feel amazing. At One Lucky Duck they also add cayenne to theirs, but I didn't have any on hand; luckily they taste so yummy even without so it's all good! The flavor of ginger is so good and the lemon adds sweetness; it makes me happy because I know ginger is one of the most powerful things you can consume for your health. It aids in digestion, is amazing for your immune system, and is even used as a medicine in many cultures. My breakfast Friday morning was a green juice before I left for the train at 6am, and then when I arrived in the city I had beet/carrot juice and kale chips as my mid morning snack. I kept my avocado in my bag, and later, at night for dinner took it out and cut it up on my salad at the bar I went to with my friends-- because I was quite hungry! Speaking of One Lucky Duck (the name of this amazing place!) I was reallly feeling lucky the other day at my internship when I drank this. Blueberries, cashew milk, coconut meat, vanilla, cinnamon, bananas. Heavenly!! This one's called "The Spanking" and it is spanking good. In fact, just made cashew milk today for the first time because I have been so inspired by the way it makes smoothies like this one taste. Arugula salad with chicken, avocado (but they only gave me 1/8 of an avocado so I pulled out that avocado from my bag haha), cucumbers, and lemon/olive oil. Not filling at all and made me sad about the cleanse and quite complain-y because I was mesmerized by the delicious hamburgers, nachos, filling foods my friends were eating! T.G.IF...or not? We know many of you are ready to go out to eat with friends, have a glass of wine or two, and not think about it anymore! We get it. It's called "cleanse fatigue" and it's definitely a normal part of the process. But let us lovingly remind you that you are so close to finishing, so give yourself the gift of seeing it through! Well, yes, I definitely was experiencing "cleanse fatigue" by the end of the night. Some exercise: Sprinting 9 blocks and 3 avenues to catch a train while carrying my ridiculously heavy bag (hahaha... lame I know... but it felt like a workout!) Side note: That totally reminded me that I have been horrible about exercising lately-- I neeeed to step that part of my life up! I miss how amazing it feels to workout all the time, running is an amazing drug! Yesterday I started out doing Purification ( no protein, just fresh fruit and vegetable juices) but then, by 4pm felt so horribly tired and cranky and hungry that I went for a regular cleanse-friendly day with protein from chicken and nuts. Purification weekend is tricky when you don't actually have time to just be sitting around all day doing nothing but watching movies and resting like the book asks. For a busy college student like myself, who doesn't have time to waste two weekends in a row like that, it becomes less of a relaxing vacation and more of an absolutely miserable experience for me. I'm just glad that I turned to cleanse-friendly foods instead of junk as a result of my emotions. After I ate some protein I felt a million times better instantly. That frown turned upside down! Anyway, the book started to come to a close with some very important messages. The average American sets some version of an intention, a resolution, or a goal at least one and a half times per year. And we all know how well those typically hold, right? The goal to lose weight, to quit smoking, to eat better, to exercise, to find a more fulfilling job...they don't stick because they often don't take into account the greater meaning of a person's life. They're not attached to a larger purpose. This is understandable. ....Look how far you've come in just a couple weeks. What you've given yourself is an opportunity. you've come into a clearing, a rise in the landscape of your life. this is a moment of clarity and perspective that not many people experience. You've given yourself a gift. It can be a small one-- a glimpse, a spark, a 2-week vacation you look back on and draw some inspiration from-- or it can be something much, much more. Now is the time to attach meaning to what you've accomplished, to anchor it to a purpose. I feel really good. I feel really happy that I have worked so hard to accomplish something. Even though I was so done with the process yesterday, and so frustrated, so ready to throw in the towel, I realized it was less about the food and more about the power. I actually felt like a prisoner to the program; I wanted to be able to make my own decisions and choose the foods that I wanted. It was a realization for me that this process has been more of a reflection on my personality and who I am than on what I eat. Being clear of my go-to foods has opened up a mental clarity that has allowed me to see parts of my personality that are incredibly impatient and thoughts of mine that are fleeting by nature but constant in that they always come up. I found myself drinking green juice in the local organic juice shop, The Stand, unfocused, impatient, ready to run away. Run away from whom? Run away to where? Run away from what? What is it that I feel I can't stay grounded in? I know it sounds harsh, but I came to the realization that it is not the people I surround myself with that I lose confidence in for the most part. It is me. I lose confidence in myself so easily, and I run away from those thoughts by alternate means. I don't love myself enough, not nearly as much as I should, and that is reflected in my relationships too. I need to believe in myself more. Not just in what I can do, or what I can accomplish, but in who I am and in who I am supposed to be. Something that has struck me in the Facebook group for the Conscious Cleanse is how incredibly positive the health coaches are. It makes me really hopeful, because they are so understanding and encouraging. When anyone slips up they don't make them feel worse about themselves than they already feel. They boost their confidence by being positive. I realized that I'm not used to that. I'm used to being criticized by the people who love me, and in turn criticizing myself that much more. It's exhausting feeling like I constantly have to be perfect, when perfect doesn't exist. I think that's been really bringing me down. All of the ideals in my head, and all of the ideals people who surround me have for me. It's not realistic. I noticed that when fellow cleansers reached out on the Facebook group, they bear a lot of worry in their posts. Worry about what the response to their mess-up will be. Fear in admitting they ate a piece of cheese or had a beer with dinner during the cleanse. Immediately after, a coach or Jules or Jo will write something positive, saying things like "What you did well today? Don't let the negatives ruin all of the good you've accomplished!" or "You can still jump back into the cleanse tomorrow!". Instead of "Yeah, you really messed that up, what were you thinking?" or "You never stick to anything" or "I knew you would ". Those kinds of statements only encourage people to have less faith in themselves and make them discouraged and not want to keep moving toward a goal. Seeing the positivity of the cleansers has made me look at myself in a more positive light. When I messed up with food-pairing rules in the cleanse, I focused instead on trying harder for the next meal, and those simple positive thoughts made me feel like a happier person. Instead of constantly feeling down because you can't be perfect 100% of the time, with cleansing or with life in general, focus on how far you've come, and how wonderful the constant pursuit of positivity is. Focus on believing in yourself so much that you feel closer to perfection than further from it. That, if nothing else, is something I have fully appreciated and learned from this cleanse. TODAY, DAY 14: You've Done it! Throughout the cleanse, I am proud to say, I didn't eat one non-cleanse-worthy item, at all, until TODAY. And, surprisingly, I am totally okay with that. Today all I had was a large salad and lemon water, until 5pm, because I woke up late and went grocery shopping. When I got home, armed with my rewards, I was so tempted, and felt very curious. I told myself that if I still wanted the junk food I bought after my large salad, that I could test the waters and start my transition-out period early, guilt free. And I mean guilt free, I deserve it, I made it to the end, I worked hard for 19 days, and I was ready. Then I cut up some beets, avocado, and roasted some brussels sprouts. I made a big salad with all of the ingredients, and devoured it, I was so hungry and it tasted so satisfying and delicious from start to finish. Later, about 2 hours later, I was hungry again, and went for quinoa tortilla chips with goat cheese. Felt fine, but then had those chips with salsa, and didn't get halfway through until I felt pretty gross. Almost nauseous. My belly felt a little bloated and there was definitely some mild uncomfortable stomach movements. It was also kind of harder to breathe since there was so much food inside of me. I felt like my body was working really hard to digest, which I've learned in the cleanse is where most of the body's energy goes to, and thus it explains why I also felt quite tired after. Because, I learned, that eating junk foods (no matter how pure and organic they are) really doesn't make me feel all that great after all. I ate chocolate potato chips and they were heavenly, I devoured them, they were just amazing, but I found myself craving a green juice after. I have not realized until today fully just how amazing I had felt over this entire process, and it took me ditching the cleanse friendly foods to realize that. I noticed this morning that my eyes are just so bright, and that my skin and hair feel softer. When I caved and ate chocolate covered potato chips I felt AMAZING because I love chocolate and it was the greatest reward ever. Salty, sweet, rich. But three hours later when I caved and ate goat cheese and quinoa chips with salsa I felt pretty gross after. I think that shows me that moderation is a tricky word, but a necessary objective. Take it easy, take it slow. Introduce junk in small amounts, and don't overdo it or it's no fun. I want to take more notice of the bad foods I'm eating, and make sure that I am not eating them regularly. I want to continue incorporating my favorite foods that I've really enjoyed on my plate throughout this 19 day process. Green smoothies-- I want to become more creative with them and try different herbs, and buy some cayenne! Adopt an 80/20 principle. Focus on the greens, veggies, cleanse-friendly foods. Add in special junk foods that I like, when I want a treat, and treat it as a treat. January 22, 2014 in "The Conscious Cleanse"
Monday, Refresh and Renew, Day 8. I woke up feeling so incredibly excited that I could finally have protein that I danced as I cut a lemon in half in the kitchen. I was smiling at my usual morning hurdle--that lemon water-- because I knew that soon, very soon, I would get to eat an almond, or chia seeds, or chicken. Starving the two days before really made me appreciate that. And as a result of both waking up incredibly late, and not having eaten much the day before, the rest of the day I didn't eat much either. I made chicken breasts, soaked almonds for almond milk, prepped a soup, cut up carrots, and made a huge bag of quinoa. ...And Day 2 of my internship. I woke up at 5am, showered, got changed, and headed to the station with my friend who was just starting her first day in NYC at her internship. So grateful to have a ride to the train and a fellow internee there. I absolutely love my internship, I know-- crazy even though it was only Day 2-- but my team is just so genuinely nice and helpful, I can tell already it's going to be a fun semester. All of which made the incredibly treacherous voyage in the snowy, slippery streets of Manhattan worth it. I also discovered the most delicious raw, organic, fresh juice bar in our building and I now have so many more ideas for delicious smoothies and drinks as a result. Since it's just simple ingredients I basically know all the recipes! : ) Now, that, is a cook's dream! Finally, looking back at the challenge of the day, "Conscious Moxie", we were supposed to dress ourselves up and focus on self-care and pampering ourselves. Unless you count taking a shower and getting dolled-up before my internship, though I did not really pamper myself by getting a massage or painting my nails, but I did pamper myself by going to bed much earlier than normal last night, and the extra amount of sleep felt great! This was mainly due to me not looking at my book at all the past two days, because I was just so distracted by work and school preparation. Bed around 8pm, woke up at 11pm, went back to sleep until 8am this morning. It's Day 10, which is almost Day 14, right? We notice as we round the bend in Week 2, the drop-out rate skyrockets. Why is that? What is in the mind that says, 'Eh, I did pretty good' or 'I feel awesome now, so I must be good to go'. Do you recognize something about yourself in either of those statements? [YES, both] Do you feel as though you've been plugging along, barely surviving the process? [Yea...] If this is you stop right now!!! Guilty as charged. I feel very clean [ by that I mean my stomach is rarely in pain, head is clear, skin seems more vibrant, hair seems thicker, mood is more even] but I am tired, and am ready to go for that chocolate cake now thank you. Or even a glass of wine. But I won't. I've gone this far, and it's not far enough. I need to understand why I crave those things and how I can manage to eat like this after the cleanse and not overdo the things that I love, like chocolate and cheese. I'm really quite positive no matter how long I worked with say, math, I would never be as smart as Einstein, but I like what he's saying there, because it's thought-evoking; it's encouraging and inspiring. What good can we do if we keep going, what amazing challenges could we have overcome if we had just spent more time on it and didn't give up so easily? I have heard fellow cleansers discuss how they kept up the routine for 6 months after the program ended, because they wanted to fully see the benefits. The Conscious Cleanse is unique in this way, because unlike other cleanses or detoxes, that would actually be totally doable and nutritious and totally manageable (minus those rigid Purification weekends). Because The Conscious Cleanse allows you to have protein, healthy fats, nuts, seeds, vegetables, fruits, galore, it really is just a fabulously healthy lifestyle. I can totally see myself adopting this for longer. I'd like it to be more moderate of course, because I love chocolate and want to be able to enjoy a glass of wine with my friends, but I also don't want the majority of what I eat be food I constantly crave. Some days, especially during those blasted winter holidays, I eat mainly chocolate and cheese! I know that's not healthy, not matter how pure and organic it may be. This cleanse has taught me already how important green veggies are for overall health, and how destructive sugar is for my mood. Even when I am starved on the cleanse, I am not irritable anymore. I can last. I feel in control. I'm not dealing with blood sugar ups and downs. But I am still tired. Physically exhausted. And I wonder if that has to do with me still not eating correctly, or sleeping enough, or having a good enough schedule. Either way, I need to, moving forward, pay more attention to the book and actually focus on the daily guidelines. And more importantly, move forward conscientiously. Jo and Jules have so many good points. For example, today's Conscious Focus: Quieting Your Mind. ..One of the best ways to manage stress is to learn to quiet your mind. This could be through yoga, meditation, tai chi, walking or running, listening to the birds, sitting quietly, or any other physical activity that allows the mind to let go. As the ancient proverb says, "The silence between the notes makes the music". I have not worked out in a while, and I always feel amazing when I do, so I think I will do my Yoga video before bed. But it's important I notice that it's not just tonight when I need to relax and destress. It's most nights, and thus, I should really incorporate this into my routine regularly. I'll sleep better, that's for sure, and I think I will be more organized as well. 1/2 quart lemon water-- was racing again to head to the city and catch a train, so it wasn't warm. I made up for lost water later in the day though. roasted cauliflower (with olive oil, sea salt, black pepper, onions, currants).... again, I really screwed up here with food pairing b/c of the currants. French greens with 4 oz herbed chicken, avocado, kalamata olives, olive oil, balsamic vinegar, snow pea shoots. Stay tuned for tomorrow, and hopefully I will get a better schedule going. January 19, 2014 in "The Conscious Cleanse"
Good Evening lovely people of the world! I had so many internal battles with myself today. Starting with my dream last night, in which I ate three pieces of cheese, and even in the dream realized how bad that was. Woke up in relief to find that it was just a dream. Who dreams about cheese as the enemy? So messed up. Today is Day 2 of Purification, where we are supposed to clean our houses, organize, and get rid of the extra stuff we don't need basically. There are great homemade recipes for non-toxic cleaners and things like that. But hey, I'm a college kid, and my house is pretty clean right now, and I just didn't have any energy to think about anything else but the challenge of not eating protein today. I walked into today like it was no big deal, as yesterday was pretty much okay. I was wrong. Today was pretty hard. I woke up around 9am and after drinking my quart of warm lemon water and green smoothie became really discouraged at the realization that I would not be able to have anything but fruits and vegetables to look forward to and 'sustain' me. I didn't want to just sit around the house all day either though, so, possibly stupidly of me, I decided to go to the bar with my friends at 3:30pm to watch the Patriots game. Being around pizza and wings, nachos, cheesy things galore really was like torture, more-so than any other day I've experienced before because I had nothing to fill that void. Everything I've eaten today only made me more hungry and just seemed to instantly dissolve in my stomach. I realize I sound ridiculous to a certain degree, because it's only a day and I am lucky to know I will have food tomorrow, but I just have to give you that perspective. The waitress at first, when I told her I have such a specific request was fine, but then when I told her I can't have tomatoes or oranges either she looked at me like I was crazy. I said "I'm on a cleanse" and she said with a scrunched nose "Why? You're so skinny?" That was nice to hear hahaaha but I told her it was for allergy testing and I have to do it because I got asked to blog about it. (Those aren't the only reasons, of course, my intention is much bigger than that, but to make her understand that's what I said). She said "Oh, well if you're blogging about it then I guess it's okay, it's what you have to do". Anyways, we stayed for the entire game, I ate my special requested plates, as countless plates of delicious, sustaining food was served around me, amazing scents wafting through the air, and I made it out alive-- scotch free-- but I never want to do that again! I came back home after my "meals" which you'll see below, and slept for 2 hours. Then, because the book says we can transition out of Purification, we can have 2 to 4 ounces of protein, I had a slice of turkey, then a date roll and an entire avocado. I neeeeeeded it. I'm currently drinking dandelion root tea and I have a chicken breast in the oven because if I'm going to last the rest of the night I'll really have to have that. Today I'm going to break down my meals in a different way, because they don't deserve the titles "Breakfast, Lunch and Dinner", it'll just make me sad to see those titles. And I've never wanted a piece of chicken or an almond or a seed or an avocado more in my life. Ever. Like please dear harvest god give me some sustenance. (Do note though, I am not miserable in a moody way today-- although I know that sounds hard to believe-- my emotions are pretty steady, I am just starved and being a baby). The only thing about today was I felt a little cramped up after the mangos and apples, but it went away shortly after. I didn't have any headaches, or any other symptoms other than my stomach hurting from being so hungry. I think this is an awesome sign that my body is free of lots of toxins, but I'm sure my body is saying "Okay lady, we're clear, you're good; you don't have any toxins, now give us something other than veggies already!" cauliflower mash-- aka 1/2 cauliflower head [I wanted more but now I am out of cauliflower] steamed, blasted in Nutribullet with roasted garlic and a pinch of olive oil, sea salt, black pepper--- quiteeeee delicious. 1/2 chicken breast (3oz) AND OMG IT TASTED LIKE HEAVEN!!!!!!! SOOOO Excited for tomorrow to feel amazing and eat real food. I love sustenance. Don't pity me, obviously I pity myself enough for the both of us ; ). Goodness gracious... this is what it's like to be a foodie without food. I already hear the music pumping downstairs, and people arriving, time to take a shower finally and be a good host. Running on low fuel, but you only college once right? Tomorrow's a holiday, I'll sleep in. (Yest.) CC Day 6: Purification Weekend Begins! Good Morning! :) Purification weekend officially began yesterday and as a result I took advantage of it and slept quite a long time last night. The book told us yesterday to Create Your Own Wellness Retreat, where we should pamper ourselves, rest our mind and body. The point of Purification is to notice changes in our body, sleep, relax, give our systems a rest. Thus, because our digestive system uses so much energy just to break down food in the body, during Purification, we drink lots of water and eat only fruits and vegetables. Suggestions also included watching a good movie, journaling, laughing, or lying on the couch. Kind of cool being told to do nothing-- and while all morning I was contemplating going out and seeing more friends, by 8pm I was just so exhausted I went right to bed. I set my alarm for 3 hours to see if I'd have energy then to head out, but went back to sleep and woke up at 9am this morning. I didn't get nearly enough sleep the night before last and as a result yesterday morning I was pretty dehydrated and tired. It was nearly-falling- asleep-on-the-refrigerator-door, tired. My internship in the city on Friday was amazingly awesome but waking up at 5am and not getting back until 8pm, then going out pretty soon after and not going to bed until 4am will definitely make you exhausted and do that to you. (Sound familiar, fellow college kids?) (And no alcohol when I went out mind you-- I pumped iced water w/ lime at the bar). I also want to let you in on how I've been feeling. I feel great! I have lots of energy, have lost 3 more pounds, and I've noticed my leg muscles feel stronger for some reason. I just feel alive and much more clear-minded, focused. There's more of a fluidity in my movements and a calmness overall, I really feel like I'm not jumping around all the time thinking of one thing to the next. I have noticed my hair is much thicker, I'm not quite sure if this is normal as it's only Day 11 technically of me adding all of these nutrients to my days, but it's pretty cool! My skin has cleared up from a couple days ago. I still have low energy in the afternoons especially, but I'm willing to bet that has to do with sleep. Stay tuned for tonight's post. And have a wonderful lazy Sunday everyone :) !! January 17, 2014 in "The Conscious Cleanse"
Today was awesome, I felt like I was in a dream land with my internship, it was just too cool. This morning before racing out the door I first drank my quart of warm lemon water and made a Banana, Almond Butter, Avocado smoothie with flax and chia-- I wanted to pack in as much protein and sustenance as possible-- although I will not lie, it didn't last long! (organic obvi!!) Spring mix salad with herbed turkey, snow pea shoots, carrots, beets, avocado, olive oil, balsamic. Note: I didn't eat the banana or apple today, they were back up and I didn't need them, but I was glad to know they were there! Tomorrow is Day 1 of Purification Weekend!!! That means nothing but vegetables and fruits! I'm excited, I've heard great things about it from the Teleseminar yesterday. I'll let you know how it goes tomorrow. CC Day 4: What Are You Grateful For? January 16, 2014 in "The Conscious Cleanse"
Howdy Hey Y'all, Just finished the most delicious bowl of raw soup, and I am pretty sure it was the first time I've ever had raw soup. Today the book tells us to focus on gratitude. So I'll start with that and make my way on over to what I've eaten, how I feel. How can you choose gratitude today, even though you may not feel it? Choose gratitude, and start to notice how your body feels. And remember, your challenges always bear gifts. Then they asked us to make a gratitude list. What's working? What's going really well? Who do you love? Who loves you? As far as the cleanse is going, I think having the online community of health coaches and former CC'ers providing guidance has been incredibly effective and that has totally been working. When I make a mistake with a recipe or food-pairing error, it's nice to know they have my back and are there with a solution. The coaches aren't going to let things slide, but they don't want cleansers to get discouraged either, and I've really been getting better at noticing as a result. Of course I love my family, yes you Mom, I know you're reading and wondering. I am grateful for my family's sense of humor, no matter what we're going through or how mad we are at one another, someone will crack some joke and it lightens the moment. I'm grateful for who they each are as individuals, each of my family members is inspiring, kind, and faithful; and are constantly trying to be better. I love my friends, they bring such a positive light to my life, and give me hope. They cheer me up when I am sad, help me get out of ruts when I'm being too negative, offer important life insights. They are generous, hilarious, and good people. I also love our new puppy Zuzu. She's the sweetest little nugget and I already miss her so much. The list of that goes on, of course, but I'm grateful for is this program. I cannot believe how lucky I am to be able to participate in it in the first place thanks to Jules and Jo, and I have really enjoyed reflecting each night on my day. I don't usually give myself the time to reflect as I am constantly forward thinking, but there's no better time than now for me to do so. As a graduating senior at a jesuit university, reflection is the core value that means the most right now. And I'm so grateful that this program is encouraging me to make that a priority. After having gone grocery shopping, school has been going really well. I know it's only my second day back, but being able to invent recipes and try the ones from the book has been a blessing. I feel so much better today because I'm varying my nutrients and actually enjoying my food better. My mood has been great all day, just in good spirits in general from seeing friends again and eating more regularly. Having snacks to take with me on the go has also helped immensely and I've been drinking more water. Physical changes include that I am breaking out on my face! According to the book, that's a sign of detox as well, hoping it goes away soon. Nothing drastic though, so thank goodness for foundation. Tomorrow is day 1 of my internship, which I am soooo excited for, so in the spirit of preparation, I have already packed my lunch and some snacks for the road. I may also add some Two Moms in the Raw crackers to my bag for the train back as well and of course a reusable water bottle. All I have to do is plop some freezer packs in the containers and they're good for my voyage. I also made homemade almond milk and had some sips of that! Raw Carrot Soup (now this was DELICIOUS) I didn't have cumin or cilantro, and don't particularly like those two ingredients anyway, so I didn't add them. I also didn't add cayenne, which I do like, cause I didn't have any. I added snow pea sprouts to the top to make it pretty! 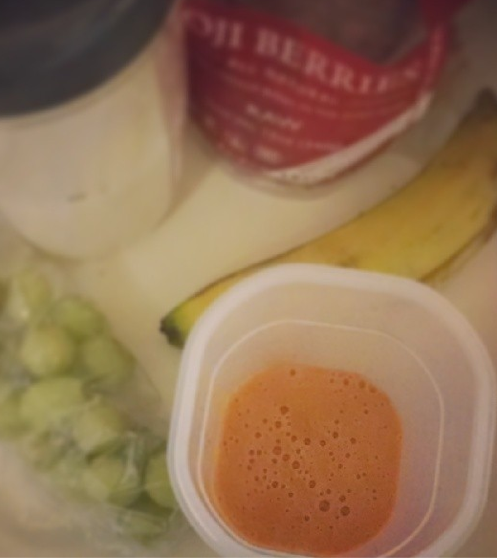 In a high-speed blender (I used my Nutribullet) blend filtered water, carrots, Fuji apple, ginger, avocado, cilantro, lemon juice, date, cumin, sea salt, black pepper, and cayenne until creamy. To warm soup more, blend for up to 5 minutes. Good Evening and Happy Hump Day, Today was pretty good.. minus the actual challenge (which was to exercise today) because I didn't really exercise-- like at all. I was going to but decided to nap instead-- oops. Don't worry, I'll get there. I was starving on the road trip, of course due to poor planning and being tired from waking up early, then when I got to school I realized I had no food in the house. My new mentality is Iron Chef Trish--- if I don't have a lot of options it's up to me to make the most of the options I have! So I did, and came up with a new favorite dish in fact-- brown rice with beets is pretty darn good! At night luckily my friend took me grocery shopping and I thus spent an insane amount at Whole Foods. Oh well, I guess I'm saving money from not buying coffee, chocolate, or drinks at the bar! 2 cups warm lemon water-- couldn't do the quart this morning before breakfast, I was too stressed about packing. Brown rice with olive oil, sea salt, pepper, and get this--- BEETS. It was quite good and satisfying actually! Then, later I was still starving, so I had two spoonfuls of almond butter because there was literally nothing to eat. I had no vegetables, the fridge was empty. My options were more brown rice or lemons-- thank goodness for grocery shopping. Yay for Two Mom's In the Raw crackers which are cleanse-friendly! Now I can have those with regular almond butter if I'm desperate, or have them with avocado! I also took some time to chop carrots and make some more Nutty Nutrishus Balls in case I'm really desperate for food during my traveling to the city this coming week. I also have almonds soaking overnight to make almond milk tomorrow. Preparation is key people! goji berries! so excited to finally try these superfoods! Amazingly delicious Salmon Nicoise. I made it cleanse-friendly by asking how they cooked the salmon (just grilled with salt and pepper), asked for just olives, onions, capers, and green beans; vinaigrette: lemon, olive oil, herbs de provence. Quite satisfying too! Goodnight! Sweet dreams! Happy food shopping to all. January 14, 2014 in "The Conscious Cleanse"
Good Evening! I'm going to make this as short as possible because I am both tired from today's traveling, and packing for school which I leave for quite early tomorrow morning! This morning I had to wake up early again, to head to the hair salon in DC while my mom went to the doctor's for a check-up. Traveling the past few days is taking a toll on me. My sleep last night was not the best, adequate 7 hours, but not great sleep, felt tired in the morning. The puppy slept on my tummy so that was comforting, she's so cute. I still feel pretty good, as far as my body-- ie, no headaches, stomach pain, things like that, and I notice I have more pep in my step. I just have not gotten used to traveling and have been eating irregularly. As a result my mood has been very much like a roller coaster. Yesterday I woke up feeling fine but kind of tired and then I had such great energy at night. Today I woke up feeling fine but tired and I really wanted my green smoothie this morning but I couldn't because there was no time and no Nutribullet with me unfortunately. I think the biggest problem, as I keep saying, is that I keep eating irregularly-- way too much time between meals. Blah blah blah, right? I am so tired right now haha. Anyways, as I usually do when on the road, I brought 32 ounces of water in water bottles and squeezed lemon directly into the water bottles. Tasted fine, although I'm starting to get worried the acids from the lemon aren't good for my teeth enamel. I may have to do some fluoride rinses and drink out of a straw like I saw two cleansers posted in our Facebook group today. I was starving at the hair salon after the lemon water, so I had a banana, and then about 15 minutes later had some Mary's Gone Crackers.... and then some Mary's Gone Crackers with almond butter. I was still not positive the crackers and almond butter were "cleanse-friendly" due to food pairing rules and potentially the maple sugar instead of maple syrup and unfortunately, it turns out my instinct was right, as I just asked Jules. They are not cleanse worthy! At that point I just needed food and it was all I had so now I need to really prepare. Despite my pitfalls, I am remembering no one is perfect, so I am not getting too down on myself, and it is more encouragement that maybe without these snacks and with more preparation I will have greater energy. My skin feels so soft and the whites of my eyes are a lot brighter I've noticed. I usually have sensitive skin and my skin just in general looks pretty darn clear. I am hungry throughout the day because I need to better prepare-- and bored of eating the same dishes. 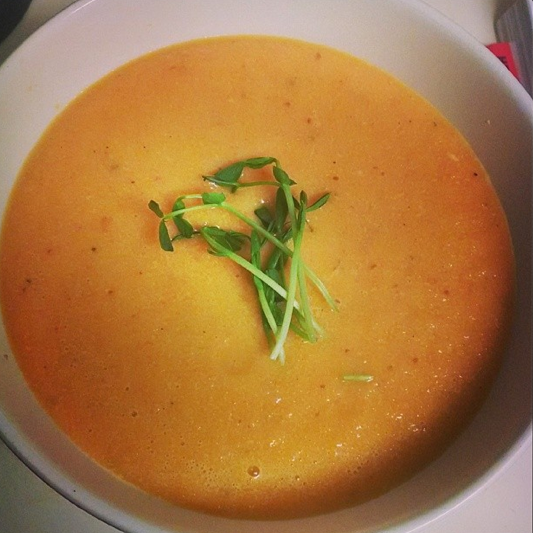 Instead of eating a huge salad with chicken, etc that only sometimes makes me feel full, I need to switch up my routine with soups, stir-frys, and eat more regularly throughout the day. It's no fun being hungry and it really affects your personality! I really did not eat enough today, but I'm excited to be great tomorrow. felt pretty foggy in the morning. Sweet Green salad with sprouts, avocado, chicken, lemon squeeze, cucumbers, carrots, broccoli, balsamic, olive oil, squeeze of lemon and apples-- which I forgot I shouldn't be pairing with veggies (without the apples I was fine). It took me a span of 3 hours to finish the salad. I was on my computer, ate the first part of it and then was full, kept munching randomly at it while on my laptop jamming out to music and preparing for school. Then 45 minutes later I finished the majority of it... and maybe 45 minutes after that I finished the last bit. 2 dried figs (which was confirmed today is not really cleanse- approved, but okay in moderation, not to be used as a snack, as it is too much concentrated sugar according to Jules and the program). Mixed greens salad (organic) with lemon herb chicken, kalamata olives, carrots, olive oil, raspberry vinegar. I'm pretty hungry right now, but it's past 7. Hopefully I eat regularly tomorrow so I am not hungry again. As you can tell I'm a little grumpy right now, haha so goodnight and thanks for putting up with me! Conscious Cleanse Day 1: And so it begins! January 13, 2014 in "The Conscious Cleanse"
It's now or never folks. And it is now! So put your big kid pants on because it's going to be a fun ride, and I'm thinking the worst just may officially be over. As I sit here drinking a bottle of water with lemon reflecting on my day today and my last five, I am so proud. I feel so glad I've been so diligent and I feel like I have such a huge support system who will make this process so much more rewarding and successful. Having received nice notes from friends following along and many words of encouragement from The Conscious Cleanse group on Facebook I have gained motivation and even more inspiration. The teleseminar taught me a lot about how important the process is and fascinating statistics about the human body, how it works, and why foods affect it. I discovered that in fact I should not be eating dried fruit (note the asterisk on my recent post about yesterday's foods) thus I will have to adapt my nutrishus protein ball recipe to not include that...easy fix! I also learned that brown rice pasta is not part of the cleanse despite it being just brown rice flour and water. The reason is it is too processed and as Jules and Jo say, you wouldn't see brown rice pasta in nature so go for the whole food version instead, just eat the brown rice. Makes sense if you really think about it. The cleanse is about giving your digestive system a break as 80% of your body's energy goes to digesting your food. So anything that slows that process down is just going to make you expel more energy that you could be using to go, say, dance around your kitchen! Anyways I will go more into detail about different things moving forward that I need to focus on as pertains to food pairing rules, food in general, cravings and other insights I found interesting on the teleseminar talk but I'm typing all if this on my phone so that'll have to be tomorrow when I'm back at a computer. Thus, here's my rundown of what I ate today, day 1 of the Conscious Cleanse (man that feels good to say). Big salad from Sweet Green in DC. Kale and spinach mix with avocado, chicken, broccoli, sprouts, lemon juice, carrots, balsamic vinegar and olive oil. Man it was deeelicious. I finished 3/4 of it and about two hours later ate the rest. I also drank a quart of water along with the meal. On the teleseminar they suggested not eating past 7 so I did that today and I feel totally fine, tummy is not rumbling and I feel great. Let me say too, that all daaaay I have felt great! And happy, and lively and energetic! I am just so excited and I don't feel scared anymore, I think I'll be a seasoned pro at this in no time. Now I just need to really focus on what the guidelines say and stick to it all. I know the next two weeks are going to be challenging , especially with interning in the city and getting back to my groove at school, but I think I may almost be better off as a result of this cleanse since I think the energy it will give me and has already been giving me will make my busy schedule more manageable. I plan to prep some meals tomorrow before I leave for school and that will definitely be a huge help. "Transition is a time to be gentle. Eliminating comfort foods and drinks can be a scary thing. It can be like taking away a baby's pacifier. You may want to kick and scream for the first few days, but your "new normal" will move you forward surprisingly quickly. So again, trust the process, and know that each day will get better. " Trusting this process, and knowing that being given the chance to participate in this amazing cleanse has already made a powerful impact in my life, before I step forward in my adventure, I have to make my intention. "What do you really want in your life? When you realize your goal, what will that give you? And what will that give you? What will that give you? And what will that give you? Keep going until you feel you've hit the goal. " I want to be fit, healthy, and happy. I don't want to feel like a prisoner to chocolate, sugar, dairy, or coffee, which I always crave. I want to feed my body with nutrients it needs and feel the rewards as a result. I want to inspire others as a result of my success. It will give me self confidence, poise, better posture, energy. It will allow me to reach for all of my dreams without hesitation. It will allow me to learn even more about nutrition. It will allow me to understand myself more. It will give me focus. It will allow me to be a nicer person. To myself, my body, others. In short, I want to be the best version of me. "Remember, this is not about perfection. It's about having a bad day and picking yourself up with love. It's about remembering that tomorrow is a new day. Regardless of your slip-ups, you don't check out, you don't quit, and you don't overburden yourself with guilt or self-loathing. You might want to reread that last sentence. You stay. Regardless of how "good" you've been, you stay. You show up tomorrow because you know each day is different. And this is life. You're not committing to perfection. You're committing to your intention. The great Earl Nightingale said, "Success is the daily progression of a worthy ideal." Commit to that kind of success. Isn't your life a worthy ideal? " To make healthy decisions to the best of my ability. To know when to be fierce with myself and when to be gentle. To celebrate my successes as well as my challenges. To be curious and to listen to my body. To recognize my journey as unique to me. To remember to laugh and trust that my best is good enough. To allow myself to heal physically, emotionally, and mentally. To love, honor, and appreciate myself just for showing up." This cleanse, for me, is about using everything I've already learned about health, nutrition, and cooking, to make myself the best person I can be. It is about a complete dive into what it is that makes me individually a healthier person, a happier person, a more successful person. I have experienced great changes already and I am excited to see what else is to come. Schaalman, Jo, and Julie Pelaez. The Conscious Cleanse. New York: Penguin Group, 2012. Print. Good afternoon! I am delayed in writing about yesterday as I had been traveling all day moving my sister in, but I'll give you the synopsis now and write a post about today's experiences after (Yay for Day 1 Official Conscious Cleanse!). Yesterday, as you may know, was Day 5 of Transition where the task was to eliminate gluten. The meal plan, thus, was no different in terms of eliminating food items, as I have already been successfully gluten-free for the most part since May anyway (minus hiccups with some sweets at xmas and a sandwich at thanksgiving). Since then I have been eating pretty healthfully-- or so I had thought. Before I get into what is making me say that, and the places where I'll really need to focus as I have learned from the CC teleseminar yesterday, I'll let you in on the rest of my day yesterday, which was actually pretty great after my awful morning. Note: where you see an asterisk (*) throughout the rest of this, I will touch on in my next post. As you know I was quite moody in the morning but I felt so much better after that banana smoothie* and my mood completely changed by the afternoon. I am definitely not a morning person to begin with so I think being tired definitely played a big part in that. I ended up finishing that last glass of lemon water and the rest of that green smoothie before we finally made it into the car to start our trip. To help me on the journey I brought a pack of some veggies and the last two Nutty Nutrishus Balls I had in the fridge*. Since removing dairy and sugar only a couple days ago from my diet I have noticed more clarity in my mind and I am much calmer throughout the day. I definitely sleep better. I did a little better with timing between meals yesterday, but I was pretty hungry between lunch and dinner so I should've had more water there and maybe another snack. Ella's Kitchen Puree Pouch: (Baby Food (yes)) it was a pouch of apples, carrots, prunes, and butternut squash). Really tasty I might add. Nothing but those ingredients. I totally forgot that we're not supposed to have squash during the cleanse though-- so luckily it was a Transition Day hiccup. We were back on the road to go check on my room at school and unload some unnecessary items.... after which I was starving because at this point it is now 6:40pm. But my dinner was delicious. Picture below is a bit dim, because so were the lights! 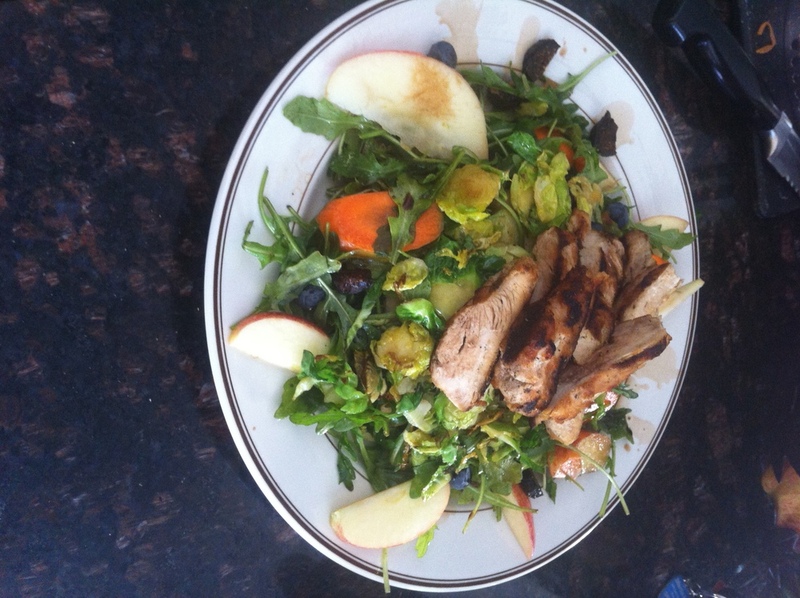 Mixed green salad with delicious chicken, beets, sprouts, avocado, cucumbers, and a simple homemade vinaigrette. I'm assuming it was a simple olive oil, lemon, champagne vinaigrette-- but I really forgot to ask. It wasn't sweet and was very light, so I don't think that was an issue according to CC guidelines. After that I was soo full and it was just so darn yummy and flavorful! 1 Banana with one 80 cal Justin's almond butter pack... these may be dangerous they're quite handy! If I were typing this last night, I'd say "Goodnight" but I'm not so I'll just pretend... Good night! Until tomorrow! January 11, 2014 in "The Conscious Cleanse"
Good morning everyone! I've been feeling really emotional lately. I woke up this morning at 5:30am (because we have to get up to move my sister into her dorm) and as I walked over to get my warm lemon water I was in such despair. I do not want the water!!! I got it though, but I confess I only made it to 3 cups, I couldn't drink the last one. I needed food. I made myself a green juice (mixed greens, lemon juice, an apple, some carrot) and got even more sad, and also felt like I could get sick because it felt like all I had inside of me was water and greens-- which is probably accurate. Our new puppy was in her cage in the other room crying for attention and as I was sitting in my kitchen I started crying and pitying myself-- ridiculous. It was a mixture of crying and laughing and when I put the green juice down I walked upstairs and my mom and sister were laughing saying they should take a video. My friends at school know I get pretty loopy when I don't sleep enough, but the mixture of that plus being low on food, and detoxing, was pretty ridiculous. Anyways, I got myself to drink a smoothie, which usually sustains me instantly. That banana almond butter one, I poured it into my glass, and half of it spilled all over the counter. I felt like Reese Witherspoon in Legally Blonde when she's crying over Warner dumping her, it was ridiculous but also a little humorous. I re-made the smoothie and now I'm out of almond milk, what can you do? I feel much better now after my smoothie, so yay for that. The first few days were pretty smooth sailing, and now I'm getting the effects of withdrawal in a different way. Anyways, as I sit here and write about the changes I can see how I've come a long way already. half a bowl of veggie soup with brown rice. I think since I combined beans and brown rice this was against food-pairing rules, so oops. Then I made some brown rice pasta with olive oil and basil, pinch sea salt. Ate a cup of that and then went to bed wallowing in my self-pity. Ridiculous I know. Today's Transition Challenge is "Eliminate Gluten". I'm already off that because I'm intolerant, so wahoo another hurdle I've already jumped, that I can smile about! :) We'll see if the rest of this sadness dissipates, and how I can manage living on the cleanse when school starts next week-- I better be prepared! Until then, I'll continue playing Bon Iver and snuggling with our new puppy; they get me. January 10, 2014 in "The Conscious Cleanse"
Good evening ladies and gents! First off, for those following, Kate did not join me for yoga. She did however, watch me act like a fool in front of the TV in my yoga pants while playing with the dog for half of it. She missed out, Yoga Booty Ballet is just downright fun! Maybe I'll catch our puppy and her doing yoga some day in secret. Today was Transition Day #3-- Cut out Caffeine-- and luckily, I have already conquered today's challenge, so I got to relax with a similar day to yesterday-- no new restrictions. Special note from a fellow cleanser to those who are struggling without caffeine, try this recipe for Dandelion Root Coffee. You can make it yourself, or buy it in the store, and it makes a great alternative. Woke up later than usual, 10:30am, mild headache all morning, especially when I first got up. Drank my lemon/ginger water, which took me like 30 minutes to do because I took it so slowly, and then I forgot about being hungry, and got a slight headache back for the rest of the morning... That also could be because I drank the quart of lemon water and then didn't eat my actual 'breakfast' which was actually my lunch until 2pm. I know, I just got carried away planning for school and sort of forgot about food--so weird. After breakfast/lunch I felt better, but a little foggy. Understandable since I'm coming down from my holiday sugar-high too, and as I understand it weening yourself off of anything like coffee and sugar will be close to a week process. Good news is no headache the rest of the day and pretty clear-headed. I made almond milk today which was so fun and cool! I soaked the almonds overnight and they got sooo big! I then blended them with filtered water this morning, strained out most of the tiny pieces left over, and voila. note: I don't recommend not eating after your lemon water, it's not ideal for your metabolism or blood sugar levels-- I was just so distracted. an entire grapefruit-- wanted to get rid of it since we can't have grapefruit on the cleanse! went shopping with my sister and got an adorable scarf-- J.Crew love. Tomorrow is a new day, I am going to be traveling so we'll see how I do with preparing food to take on-the-go for once! Love, Health, Happiness to all. January 09, 2014 in "The Conscious Cleanse"
Good evening friends! I did it! That's two days of transition followed, dare I say, perfectly. Remember, Transition is all about slow and steady changes, and getting used to eating clean; it is about helping yourself ween off the foods. Not being a canon-baller paid off today. I allowed myself to focus on precisely what the Transition Day rules were and followed accordingly. I also feel like I have an advantage though since I already have been off coffee all break and have been mostly off gluten since May (editor's note clarification for my 100% gluten free aunt: mostly, minus the recent following gluten foods over xmas break: three xmas cookies, two spoonfuls of speculoos and sea salt caramels which are coated in flour), so fewer hurdles to conquer in the next coming days which is really nice. I've had a surprisingly grander amount of energy all day and my entire body really just feels so clean! My tummy feels happy or something. I know I sound crazy but it's true. I'm unusually happy, like really I just want to smile and dance around and go run a marathon (well maybe not the marathon part but definitely the former two). I think drinking so much water has really been great for me too. I remember when I drank coffee every morning for my internship (as a reward for waking up at 5am and out of necessity for that same reason) my heart would race all the time and I had heartburn as a result sometimes at night. Though I was eating a good amount of vegetables and overall a pretty well-rounded diet at school, I was still a sucker for coffee, chocolate galore, and dairy. Cutting coffee out over break, for one has just made my mood better in general. When I am awake, I know I am really awake and not simply "caffeinated". I have to admit, I do miss coffee, I both love the taste and love that extra boost, but right now while I have the luxury of sleeping during break I don't need it. I also don't need any heart pain, so bye bye-- at least for 2 weeks. Hopefully I can stick to that routine while I intern in the city this semester-- that is one of my main worries. Medium arugula salad with 1 cup brussels sprouts (grilled/stir-fried in olive oil with sea salt), 1 oz brie cheese (transition days approved), couple golden herbed potatoes (transition days approved), balsamic vinegar, and 3 strips of grilled chicken leftover from the salad yesterday at lunch. Note: This one was funny-- my mom, sister and I took my sister's friend out to an Asian cuisine restaurant and I was panicking inside about what I'd be able to eat. I definitely didn't want anything with additives like MSG or any of that junk, and I also know that many sauces contain sugar and alcohol as their main ingredients. Sure they taste delish but they are not nutrish. I spoke to the waiter and my mom said "She's on a cleansssse", to which I said sadly I didn't want to look at the wine menu. I don't like when people are picky at restaurants, having served food at a pool cafe for quite sometime, so I decided to let my humor make it easier. The waitress was hilarious and very cheery and acted as a detective for me; she asked the chefs basically what I could have to ensure it didn't have soy, sugar, etc in it. Ultimately, I'm sure I could've gotten plain salmon with rice, but I went with steamed chicken and siracha with some basil and brown rice. Yes, simply those 4 ingredients. (Note: for the CC technically this violates the food-pairing rules. I should have ordered chicken with a vegetable and not paired chicken and grains together--- but it's still Transition period so as far as those guidelines I am golden). And surprisingly, it was delicious. Since I was with my family I knew they wouldn't really mind if I was a little picky like that, but I guess if I was with anyone else I would be more discreet about it and make a quicker decision. Sometimes making special requests tends to make those around the table uncomfortable, especially if the waiter doesn't handle it well. With that being said, don't be afraid though, just stick to your guns and ask. It's better than ruining all your hard work if you're on a cleanse, and necessary if you have a serious food allergy anyway. Well, if you count walking around the museum-- JUST KIDDING. I'm going to do my Yoga Booty Ballet video before I hit the hay. Makes me feel like a million bucks. Stay tuned to see if my sister joins me like she said she would--ha! Sweet dreams about vegetables everyone! Imagine a pool full of cool, clear water on a hot summer day. There are two ways in: the first is taking a deep breath, closing your eyes, and hurtling yourself at the water; the second is slowly coming down the stairs, one step at a time, gradually acclimating. The end result is the same: you're fully submerged and happy to be there. In the parlance of pool-goers, "It's great, once you're in". As you may have gathered, the Conscious Cleanse is the pool in this analogy. You can get in any way you want. Ultimately your body will adjust, and you'll feel comfortable and refreshed (so much so, you probably won't want to get out!) But here's the thing: because the Conscious Cleanse is about relishing the experieence and practicing mindfulness, we're going to suggest that, even if you're a canon-baller by nature, you try the climbing-down-the-stairs approach, rather than jumping in"
I wish I had fully listened-- because starting the day off as a canon baller and then treating the end of the day as a coming-down-the-stairs person really messed with my system-- I have the worst headache right now! Then-- Grandma convinced me since it's just Transition Day 1 I could have a chocolate peanut butter cup. I had just one, and man it tasted yummy. Then a little later I got a headache. Reached for hot ginger lemon water and it worked really well! The headache was gone very shortly after. Here's where I lost it though-- I remembered my grandpa's birthday dinner was tonight and my sister reminded me that technicallllly I don't have to give up sweets until tomorrow and the rules of Transition Day 1 state that the only thing you need to do today is add more fruits and veggies to your day. Head is pounding, I haven't had a migraine this bad since the summer. I'm willing to bet it's because I tricked my body into thinking I was cleansing all morning and then put the sugar which it's been used to all break because of the chocolates I've devoured, back into the system. Tomorrow I am going to be happy not to see sugar now since it's had such a horrible effect on me. Sugar withdrawal is not fun! Really wishing I had some turmeric root right now, but all I have is ginger-- which normally works, but this one is so painful it's really not helping at this point. I'm going to wait another 20 minutes and if still in pain, reach for an Advil (which by the way I rarely take), maybe it'll help. January 08, 2014 in "The Conscious Cleanse"
Please note, these are direct quotes and excerpts from The Conscious Cleanse, see footnote for source line. I'm training for a race and/or I exercise a lot. Will I get enough food? And what about protein? Yes, you'll get plenty of food! There's no calorie restriction with the Conscious Cleanse. Good sources of protein on the cleanse include beans and legumes and organic, lean, grass-fed animal meats like turkey, chicken, lamb, wild game, and fish. Q: Does Odwalla or Naked Juice count as "fresh juice"? A: Sorry, but nope. These types of juices are marketed as fresh juices-- and are certainly a healthier choice than diet soda-- but they're mostly "fruit juice concentrate" (read: sugar) and pasteurized. What vitamins and minerals were in that product are generally reduced in the process of pasteurization. For a fresh juice, go to the juice bar where you see the whole food in its natural state (a whole carrot) and can watch it being juiced. A: Truly, the Conscious Cleanse, except for the purification days, is designed so you could safely eat this way year-round. Generally, we recommend implementing the full program up to three times per year. We typically recommend cleansing during the first part of the year, to ride the wave of a new year, a fresh start, the feeling of rebirth. It's a powerful time of the year in our culture, so cleansing is often supported by the people around you. Spring and late summer are also excellent times to cleanse because of the abundance of fresh (and less expensive) produce available. Strive to cleanse, at a minimum, at least once per year. You're worth it! Note: they have a great shopping list of every single food broken down in the book, these are just the big categories. If you're sugar sensitive, avoid high-GI foods like watermelon, lentils, peaches while on the cleanse. In order to better serve your digestive system during the cleanse, it is important you choose to pair foods accordingly. It's important thus, that if you are creating a main meal, you pair only vegetables with one non gluten grain. Or meat with vegetables. Don't pair meat with grains. The two of them are too dense together and cause your digestive system to work too hard on the cleanse. See the above chart. If feeling foggy or need more protein, supplement 4 to 8 ounces chicken breast or some lean animal protein 1 to 2 hours later. Finally, this hardly covers the bases. The book is absolutely fabulous. I highly recommend getting it if you are truly interested in healthy eating and cleansing. You can find it here or at your local bookstore. You can also find out more about The Conscious Cleanse team here. January 02, 2014 in "The Conscious Cleanse"
HAPPY NEW YEAR! In the spirit of holiday giving, I'm sharing with you some recipes that I will definitely be trying on my cleanse coming up in about 6 days. I also wanted to introduce an inspiring health advocate. We sometimes think of models as crazy people who don't eat much at all, are rail thin, and maybe even smoke to achieve their weight. I think Valentina Zelyaeva, the face of Ralph Lauren, is an awesome example of just the opposite. She has achieved a lot, and much of her success she relates to her lifestyle. Like The Conscious Cleanse program guidelines, she also starts every morning with warm lemon water and a juice. Also like The Conscious Cleanse suggests, she consumes nuts, soups, salads, and incorporates extremely healthy oils in her daily routine. As evident on her instagram ( @val_zelyaeva ) and her blog posts (http://blog.valzelyaeva.com/ ) about her daily juice habit it is even more evident to me that we should all be doing the same. Have you seen such beauty? "Juicing requires less work for your body to absorb and assimilate all the antioxidants, vitamins, minerals, and enzymes than if you were to drink the whole blended vegetable or fruit. This means faster detoxification (the antioxidants bind to toxins), more elimination (bye bye toxins and old waste matter), alkalization, a healthy glow, decreased inflammation, and more energy!" In a medium bowl, combine almond milk, chia seeds, agave nectar, vanilla extract, cinnamon and sea salt. Let sit and soak at room temperature for 20 minutes, or cover and refrigerate overnight for a yummy breakfast the next day. Blend everything but the coconut flakes and hemp seeds in a food processor for 1 to 3 minutes or until smooth. Roll almond-date mixture into about 36 1-inch balls. Roll balls in hemp seed and coconut mixture and place in a container with a tight-fitting lid. Store in the freezer or refrigerator and enjoy chilled or frozen. Blend all ingredients in a food processor until paste forms. Refrigerate in a glass container for up to 3 weeks. That's not even the half of it, just a taste! Stay tuned for more, and for my reactions to the recipes. About a month back, when Julie Pelaez contacted me about participating in her Conscious Cleanse program, free of charge, and blogging about it, I was obviously elated. The chance to free my body of toxins, in a smart, research-proven, sensitivity-friendly way, for free, feels like a life changing moment in itself. As I prepare for a my 14 days of cleansing (plus 5 transition days), I am thinking about what I hope to accomplish in the process. Discover some new favorite vegetables, superfoods, daily practices, sure. But what I most hope to accomplish is a deeper understanding of what makes me tick, how my body reacts to what I consume, and maybe even what the healthiest, greatest version of myself feels like. I already have seen how much better I feel since I've been gluten free circa July 2013. Now I'm wondering how my body will react to no dairy, no chocolate, no coffee, and tons of amazingly beneficial fruits, veggies, seeds, and oils. Could I have glowier skin? Shinier hair? Will my dry skin disappear and my under eyes no longer need concealer? We'll see. Will I have more energy, sleep better, boost my metabolism? We'll see. Since I've been back home for the holidays I've already noticed how powerful food is for health in a mini experiment I did. Last Wednesday when I got home, I had a pretty awful cold. My head was heavy, congested nose, headache, cough, lymph nodes raised, tonsils red, and my voice even sounded sick. I went to the doctor, and of course it was just a virus. He wrote me a prescription for antibiotics but told me that it might be better not to take the antibiotics and just rest up, fight it naturally. It's better for your immune system to not constantly flush out all of the good and bad bacteria from your system. Instead of driving to the pharmacy, I made my way over to Trader Joe's and armed myself with foods that I've known to be pretty powerful. I got some Lemon Ginger Echinacea juice, organic lentil soup, kale, organic apples, grapefruits, coconut water, and shaved brussels sprouts. Each day I became noticeably better, and by eliminating dairy and congestion-instigating foods, my sinuses cleared up pretty quickly. I know I wouldn't be here a week later, almost good as new, if it weren't for the healthy food; I know my cold would've lasted longer. Right now it is full speed ahead, so as I prepare for January 8th's transition kick-off, and January 13th's official start date, I am reading up on some pretty great things I got for xmas, like Michael Pollan's "Cooked", (which my lovely sister and her friend got autographed for me! 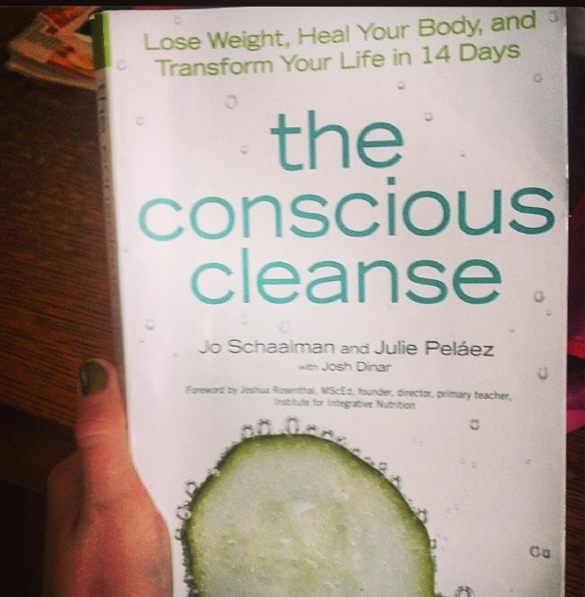 ), and of course, my Conscious Cleanse book. I'm savoring every last bite of cheese, every piece of chocolate, and beginning to eliminate some of my favorite goodies, like coffee to make my cleansing process easier. I can't wait to share my journey with you very soon, so stay tuned, thank you for reading, and a very Merry Christmas and Happy New Year to everyone!